If you're a fan of practicality dressing when it comes to fashion, you'll love this cute pairing of a blue bodycon dress and kate spade new york stud earrings navy gold. Play down the casualness of your ensemble with black leather heeled sandals. 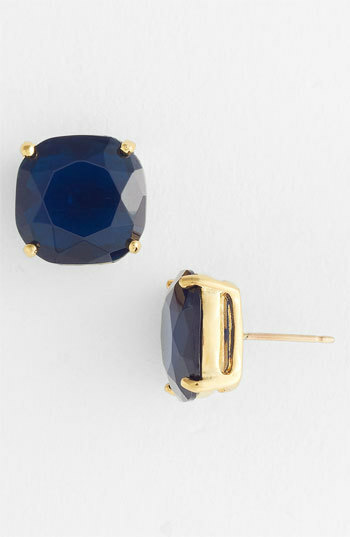 If you're obsessed with relaxed dressing when it comes to fashion, you'll love this extra cute pairing of a charcoal tank and kate spade new york stud earrings navy gold from Nordstrom. Up the ante of your ensemble with silver leather flat sandals. If you're all about relaxed dressing when it comes to fashion, you'll love this absolutely chic combo of a silver sweater dress and navy earrings. Bump up the cool of your look by finishing off with navy embellished satin pumps.